Hercinia Arts Collective is a multi-disciplinary company whose aim is to blur the boundaries between traditional performance and visual art forms and bring people into art. 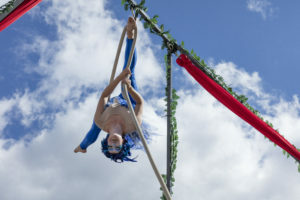 Created by a group of dance, aerial and theatre performers in 2009, we create dynamic physical performances that engage with an audience through story, complexity of theme and human spectacle. In 2012, we incorporated as a not-for-profit, to allow for further opportunities in creation of new works for a varied spectrum of audiences. Since inception of the company, our unique performances have been showcased throughout Canada from street festivals to art events to dance showcases, and everything in between. Over the years, our focus has been particularly on outdoor performances, as a means to bring our art to a broader public who might not otherwise have access to artistic performances through conventional means. As such, we have been involved in many busker and street festivals. As circus, theatre and dance artists, our main investigation in performance is to use circus as a language through which to explore themes, characters or to tell stories. As a practice based on visuals and movement, circus is an exciting language because it can communicate on such a visceral level. This makes it accessible to a varied and wide audience. Performance highlights include: “Infestation” for Dance Ontario at Nuit Blanche Toronto (2009) and re-imagined for London’s La Petite Nuit Blanche (2012); “benched” at Day of Delight in Dufferin Grove Park (2009) and Dance Ontario’s Dance Weekend (2013); “Corporate Chaos” at Aer Time (2012), CCAFT (2013) and A Spectacle of Play, our self-produced showcase of new works (2014); “In Bloom” at Day of Delight (2012) and at Cave Springs, Beamsville; “Gargoyles” at Festival de Cirque in Vaudreuil-Dorion, Quebec (2011), the In the Soil Festival in St. Catharine’s (2015), and Dubai Comedy Festival (2015), among others; “Birds of Flight” at Celebration Square in Mississauga (2016), The Junction Solstice Festival and Canada Days at Nathan Phillips Square and Mel Lastman Square (2017); and street theatre show “HASA” at Toronto, Ottawa & Halifax International Buskerfests and Buskers on the Bay in Saint John.